Recent discoveries of more than 1500 hominin fossils from the site of Rising Star in the South African Cradle of Humankind, attributed to a new species (Homo naledi),1have attracted global interest. As yet no secure date for this extraordinary material has been obtained, and the relationship of this species to other Plio-Pleistocene taxa has been greatly debated in the media. Here I report results of morphometric analyses that may facilitate an assessment of the age and affinities of crania attributed to H. naledi. 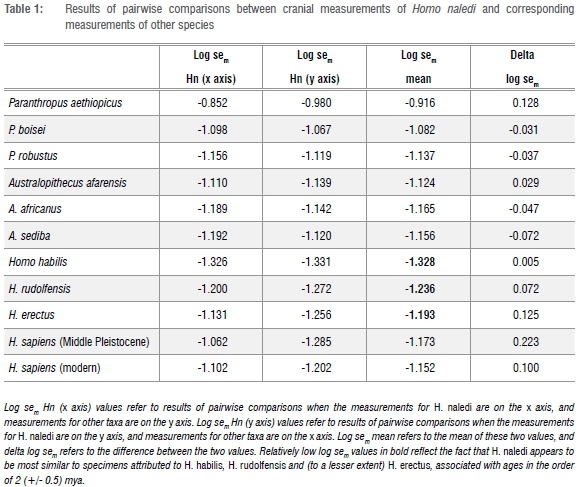 The method is based on a least squares linear regression analysis of mean values of measurements for crania of 12 hominin species (Table 1), as published by Berger et al.1 The analyses were performed to obtain standard errors of m-coefficients (sem) in regression equations of the form y = mx + c, based on pairwise comparisons of cranial data, as described elsewhere for pairs of hominin specimens,2,3 taking into account criticisms raised by Gordon and Wood4. The degree of scatter around a regression line of pairwise comparisons is quantified by the sem statistic. Log transformed sem values for conspecific pairs of modern vertebrates (as well as invertebrates) display a normal distribution with a mean value of -1.61,5 which has been considered to be an approximation of a biological species constant (T) with a standard deviation of circa 0.1,3 and which has been used to facilitate a mathematical (probabilistic) definition of a species5. In the context of results reported for conspecific pairs of modern taxa, it is relevant to report two results from the current study. Firstly, H. naledi appears to be significantly different (dissimilar) from other species listed in Table 1, because all of the mean log sem values listed in Table 1 are outside the 95% confidence limits around the mean value of -1.61 +/- 0.1 for conspecifics. Secondly, H. naledi appears to be most similar to specimens attributed to early Homo, notably H. habilis, and (to a lesser extent) H. rudolfensis and H. erectus (see numbers listed in bold in Table 1). A conclusion from this analysis is that the claim that H. naledi represents a distinct species appears to be warranted, at least from cranial data. Without assuming that log sem values can provide accurate dates, the results presented in Table 1 may be used to provide an estimate for the age of H. naledi, here considered to be in the order of 2 million years (+/- 0.5 years), recognising that the maximum age for H. rudolfensis is circa 2.5 mya, the age for African H. erectus in this comparative study is circa 1.5 mya, and the age for H. habilis from sites such as Olduvai Gorge in Tanzania is circa 1.8 mya. This research was supported by the National Research Foundation (South Africa) and the A.W. Mellon Foundation. I am grateful to Sue Dykes for assistance and discussion.